Tony Buzan is an educational consultant well-known for his promotion of mind maps as a way of developing creativity. (You can see an example of a mind map on the right). In this short video, you will hear Tony talking about how to improve your creative thinking. Video time; 3 mins 36 secs. Activity time: 10 to 30 minutes. 1 Can everyone be creative? 2 Can you learn how to be creative? 3 Does creativity come from the right brain or the left brain? 4 How, for example, can you train yourself to think faster? 5 What example does he give of "thinking out of the box"? 6 Most people say: "This is the way I think" Why is this wrong? 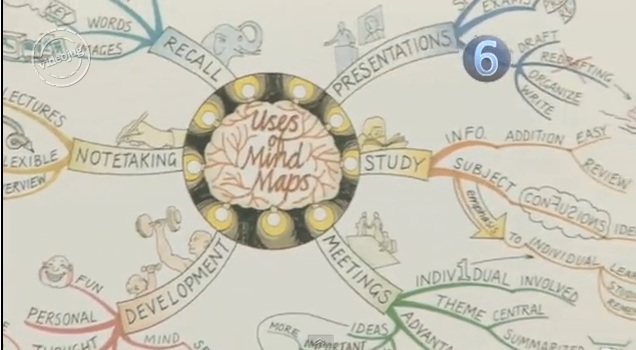 7 Why do you think he uses the mind map to illustrate his last point? For a summary of the talk, go here. 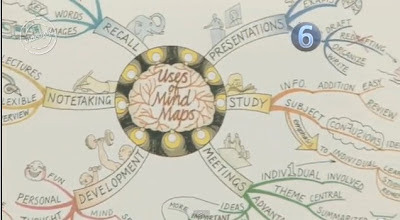 If you would like some ideas on how to use mind maps to learn English, go here.